Audiophiles are a class of people that is in pursuit of music gear that makes the music playback sound exactly like it was originally played. Audiophile headphones cater to this maniacal need for neutral and hi-fidelity sound. The precision of the audio reproduction depends on a number of factors like the recording equipment, the PC sound card, your ears etc.. 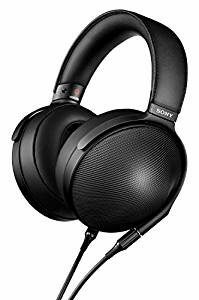 But these best audiophile headphones do their part diligently and produce near-perfect audio without affecting the other parameters. These are the most exciting headphones to work with and bring you amazing bang for the buck. What’s the definition of audiophile headphones? Audiophile headphones are those which can play “hi-fidelity sound” – which refers to highly accurate reproduction of sound recorded in the studio. This is has very little noise or distortion tainting it. Audiophile hi-fi headphones also have a neutral frequency response. This means none of the frequencies are boosted to sound bolder or recessed. The hi-fi term is sometimes easily confused with high-resolution or high definition sound. Hi-resolution sound generally refers to high quality digital sound. It need not be particularly neutral but it will have a good amount of details. Misusing the ‘hi-fidelity’ tag is generally more difficult than the oft-used ‘hi-resolution’. Are audiophile headphones worth it? Do they sound different? Not all expensive headphones are audiophile headphones. Some merely cost more based on their brand value. True audiophile headphones will definitely sound better than your $7 stock earbuds. You will be listening to more details. Complicated songs will play better on pricier headphones. You must be aware of your sonic preferences before you invest in a hi-end headphone. If you are a casual listener who wants pleasant warm-sounding cans, audiophile headphones may not satisfy your requirements. Audiophile headphones may sound clinical to some folks because of their uncoloured sound signature. Their audio is like a blank canvas. You can always use your equalizer to boost any frequency. You can bump the bass to make them sound more fun or pump the treble for the extra bite. If you buy fun-sounding headphones which have colored frequency response, it will be harder to equalize them. Audiophiles love playing with audio and watch it transform with different audio effects. In this case, hi-fidelity headphones serve them best. How should Audiophile headphones sound? The best audiophile headphones will make you visualize the band playing as if it’s happening right in front of you. You will be able to position the instruments and players correctly around you. The instrumental timbre must be spot on. They should project the actual space of the recording and how the instruments were placed within this space. They should offer you good dynamic range. This is the ratio between the loudest signal you can hear to the lowest volume. The better the fidelity and noise isolation of the headphone, the wider its dynamic range will be. Audio:As always audio is our first priority. More so, in the discussion of the best audiophile headphones. We were careful to choose only the true hi-fidelity gadgets. These also give you a barrage of details in the audio. So these cans end up sounding original without missing a beat. Value for money: As audiophiles, we need to spend smart to indulge in all the right equipment, from the correct amplifiers to the proper wires. So we checked if we had to spend way too much money for less returns. Each of the best audiophile headphones on this list gives you twice the quality for their price. We didn’t settle for anything less. The cans here span low to high budgets. We found some true gems even at low prices which beat the costlier headphones at their game. Comfort: Audiophiles are going to be glued to their new headphones. So we checked if the headphones were primed for continuous use over prolonged hours. The best audiophile headphones feel like an extension of your own body even with a few hours on them. Features: Since you are dishing out the greenbacks, why not get the extras? The best audiophile headphones are equipped with some cool features like wireless connectivity, detachable cables, different input resistance and what not. Some of these are relevant to the equipment you use to drive sound to the headphones. Most of Sennheiser headphones are known to have audiophile chops. But the HD600 audiophile headphones have been widely regarded as their chief warlord. This headphone has the bass all audio-nuts drool over. Its control is iron-clad without sacrificing any of its fluidity. The midrange detailing is a revelation. The highs are left to be smooth and comfortable to listen to. This remarkable headphone walks a tight balance of audio, comfort and budget, so it took a cakewalk to the top spot on the best audiophile headphones list. Architecturally, Sennheiser HD600 offers comfort in oodles. But since it is meant to be stay-at-home audiophile headphone, it doesn’t look like a million bucks. The build is primarily plastic. The headband core and the grille on the open-back earpieces is aluminum. The build could be more solid but it holds up well anyway. It weighs middle-of-the-road at around 9 ounces. It sports oval earpads that encircle the ears. These are padded with slightly stiff foam draped in velour pads. The earpads are user-replaceable but quite costly. The cable of these hi-fi headphones is detachable and connects to both the earcups. For convenience we prefer the one-sided cables. This cord is 9 feet long and ends in a ¼ inch plug. They have lightweight aluminum voice coils for unmatched accuracy of audio. This also gives you a fast transient response so the bass decay does not mess up the mids.A 6.5mm-3.5mm adapter is included. Equipment: Since these are 300Ohm headphones, we drove them with a Bottlehead Crack tube amplifier. We turned to the Aune X1 DAC for optimum configuration with these headphones. The audio is where the Sennheiser HD600 audiophile headphones make a lasting impression. If perfection has ever been achieved, it’s with the bass of HD600’s audio response. It extends well into the sub bass region. The frequencies are nuanced and carry good definition. There’s no bass boosting here. Still the bass sounds powerful and makes the audio sound fun. Only planar magnetic headphones can do sub bass better than the HD600. The midrange is beautifully crafted and achieves absolute victory over other headphones on this list. There’s a warm vibe to them which makes the audio lively when coupled with bass. They can easily lull you into a visual reproduction of the singer’s emotion with the Bottlehead Crack tube amp in play. The highs are slightly rolled off. It also looks like they are less refined in these hi-fidelity headphones. We are thankful for the former because no matter how loud we drive the HD600, they don’t grate on our ears. Even with the slightly laidback attitude of the treble, we love how they partner with the bass. They are consistent in their performance and rise to the challenge of complicated songs. 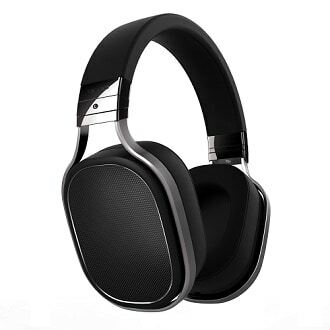 The audio of HD600 audiophile headphones is set in a wide soundstage given its open-back configuration. The clean sound is layered with abundant details. Sennheiser has barely found the need to fiddle with their top-end headphones. But every once in a while, they debut a technological marvel, which is why the market was hyped about the HD800 audiophile headphones. Hitting the true high end of hi-fi headphone spectrum, the HD800s have an unrivaled spatial presentation of truly transparent sound. We were stunned by the clarity on a professional level. But do remember that at this price, the audio gets strictly surgical. As audiophiles we didn’t think twice before including them in the best audiophile headphones list. Most of the hi-end headphones resort to wooden veneers or subtly classy colors to look their price. Sennheiser breaks the stereotype with a futuristic-looking gadget that would look at home in the vanishing car of James Bond. The silver and black design looks hulked up. And they have the large earcups that pack 56mm patented transducers that Sennheiser claims, is a first in the market. They engulf the ears in long-term comfort. The microfiber earpads rest comfortably on the ears over the marathon testing. HD800 is made of high grade plastic with metal only as reinforcements. Hence it comes down to 11.6 ounces in spite of the beef. These audiophile headphones have ports on both sides to connect to the Y cable. Detachable cable that comes with it spans 9 feet and is Kevlar-reinforced against damage. It ends in a metal tubing followed by a 1/4 inch studio plug. The cable conceals silver-plated, oxygen-free copper wire. Although they cost premium, HD800s are not shipped with a6.3mm-3.5mm converter. Equipment: You can pair them up with an Asgard 2 amp or the Decware CSP-2 for the best performance. If DAC is absolutely important to you then a Bifrost DAC should serve you well. The audio of Sennheiser HD800 audiophile headphones has left many people with a gradual realization about their true powers. These are the most technically-gifted headphones you will come across in the market right now. The soundstage is truly massive in both width and depth. The open-back of the headphones helps in staging the audio. They project the audio image with utmost realism right in front of you. You will be startled by how near and original the band performance sounds. The midrange is the prettiest features of HD800 hi-fi headphones. They have absolutely no coloration to speak of. The frequencies are transparent and display each and every detail of the song. Both male and female vocals sound so natural without any hint of the digital strain on the headphones to make them sound that way. Midrange performs effortlessly. The bass is similarly laudable in its definition and reach. The reins of bass are held tight. Lower-registers move with unconstrained agility even when the complicated music plays but the bass is lightweight. Even for the music purists, it sounds slightly more dialed down than neutral. This is where HD650 beats the HD800. The former walks the balance between taut and light bass. The treble of HD800 is incredibly detailed and clean unlike HD650 which was a smidgen grainy in the top end. But it is brighter than neutral. So there’s an extra sizzle to the higher frequencies which translates to sibilance to the audiophiles. That being said, HD800 remains an ingenious partner to audiophiles and is the next best thing to owning a speaker. Audio Technica has mastered tonal balance like no one has. They emphasize on neutral sound but their masterpiece, M50 headphones, are deliciously warm. 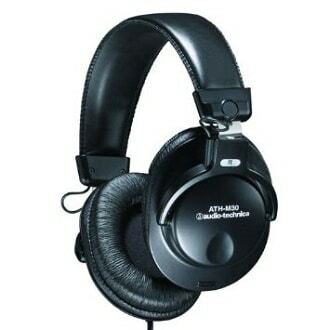 Their ATH-MSR7 audiophile headphones are the cheapest low-resolution headphones in the market. Their reference quality audio sounds much more expensive when paired with the right amplifier. Their budget-oriented package is just another reason why they should be on the best audiophile headphones list. Audio-Technica is the boss at managing quality and budget as evident from their M40 and M50 headphones. But the MSR7 audiophile headphones replaced them all as the style icon of their lineup. They have a metal core in the headband as evident from the aluminum peeking out. The backplate of the ear pieces also has some aluminum highlights which make them look classy. Because of the opulent padding on the headband and the earcups, there are no pressure points on your ears. You can use MSR7 for hours together without any discomfort. The pressure of the headband sustains it on the head during physical activities without clamping too hard. The MSR7 studio headphones come with 3 cables. One is a 1.2m cable with a smartphone-friendly mic and play/pause button. Then there are two simple audio cables: 1.2m and 3m. Between these, they cover every possible use of the headphones. The earcups fold flat for easy storage. Equipment: We powered these hi-fi headphones with an Audio-Technica AT-HA22TUBE amp for a luscious audio. If that’s not readily available toyou, drive them with a FiiO E07K USB DAC and headphone amplifier. Do note that the sound signature of MSR7 is sensitive to the partnering equipment. Audio-Technica MSR7 audiophile headphones start wowing you right from the beginning. After burn-in, the audio only gets clearer. Being a true hi-resolution headphone, the audio is superbly detailed. It reproduces the songs bit for bit. So if you play a bad quality recording, the flaws will be heard. So we turned on our high resolution files for listening to these. The clarity of sound almost makes it sound clinical. But pairing with a warm amplifier brings out the natural tone. The audio of MSR7 hi-fidelity headphones is highly balanced just like the M50x. To keep up the tonal balance, the bass draws a line at its reach. It never meddles with the mids. And it operates without a boost. The bass extension is moderate, not as powerful as the M50x. But that’s what makes MSR7 studio-quality. The midrange flows with gusto. It is rich, clear and lively. It almost sounds a little forward but it toes the flat line. The treble extends well into high frequencies. It is detailed but smooth. There are no indications of sibilance. However, there is small bump in the upper mid and lower treble frequencies. If you are a die-hard fan of ultra-neutral signatures, don’t worry. The warm tube amp will smoothen out the anomaly. Soundstage is good but nothing close to the previous two headphones. Instrument separation is dexterously done to accommodate different layers of details. AKG K702 studio headphones had some big shoes to fill after the commercial AKG 701s. These sport one of the most amazing soundstages we have ever heard. The wide open soundstage is treated with reference-quality neutral sound. The audio is detailed and dynamic. The analytical performance is best for the purists. Those of you looking for fun sound should buy the Sennheiser HD650 instead. The value that K702 brings to a studio bought it a place straight into the best audiophile headphones list. The AKG K702 audiophile headphones are so famous for their audio that we didn’t give much thought to their architecture. 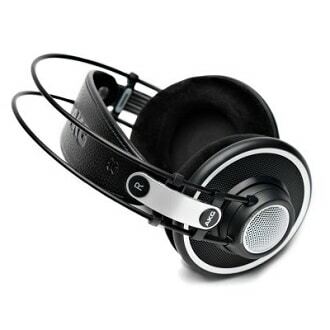 Their uber-comfortable design impressed upon us as to how much AKG cares about their customer. 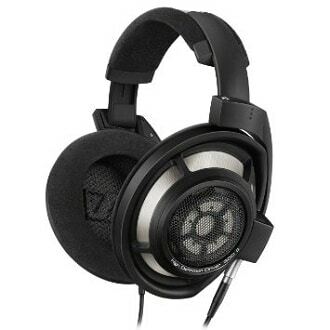 They are formed much like the AKG K701. They use a suspension headband design. A genuine leather band rests on your head. Two suspension cables run over it for stability. There are over-large round earcups padded with soft foam and the softest velour earpads. The cable of these studio headphones is detachable. The 10-foot cord uses a custom connector to connect to the earcup and terminates in a 3.5mm plug. A threaded 6.3mm connector is included in the pack. AKG caps it off with excellent customer service. Equipment: We would pair K701 with FiiO E09K desktop amplifier for some musicality. The Black Pearl Headphone amp is another well-fitting option. AKG K702 audiophile headphones are generally merited for the way their audio is staged. The soundstage is massive and quite realistic. You can step in there with the instruments and rock with the singer. The imaging is 3D and surrounds your head. But it takes effort first. You need to give them 50-60 hours of burn-in to settle down to a neutral sound signature. They tend to sound sterile off the box. With some burn-in, there’s a little more character to the audio though not much. The K702s are known to be intensely neutral. They let the audiophile lend any character to them. As with the Sennheiser HD800, you won’t have any moments of sheer brilliance where some part of the song sounds absurdly amazing. But with time you will appreciate the profusion of details and the ability to influence the music the way you like it. The bass has excellent definition and detailing. But this studio headphone doesn’t delve as deep as the HD650 or Grado RS1. So you are left with low impact. This works out great for jazz, classical, electronica. But the bassy genres sound unexciting. Good news is, you can always pump up the bass. Midrange of these audiophile headphones is flat as a pancake. It is transparent and layered with a heap of details. The natural tones of the male or female singer are relayed as original. The female vocals sound hauntingly real in some of the songs. The treble is highly detailed. There’s no extra fizz, no hint of an early roll-off either. have unlimited budget. These open-back headphones balance comfort and audio so delicately that we figured we could have them on for hours. The sheer musicality in such neutral headphones blew us away. Audiophiles and casual listeners will love the Amiron alike. They sing their way right into the best audiophile headphones list. The Beyerdynamic Amiron home headphones are handcrafted to perfection in Germany. They look like the technological marvel they are. The design has a decent spattering of metal for reinforcement. The forks that hold the ear pieces are done with a dull metallic sheen. The back of the earcups feature an open grille as these are open-backed cans. The ear pieces are large and round. They are mounted with plush and deep earpads that surround the ears. Beyerdynamic chose microvelour to drape the cushion. Not only does it feel extremely comfy, it is also pretty breathable. You can go on for 3-4 hours without taking them off. The underside of the headband also has velour while the top side is coated in Alcantara, another soft material. The ear pieces are large so the design lives up to the “Home” in their name. They are best worn at home, given their low noise isolation too. These audiophile headphones have a detachable cable. It connects to both the earcups via a Y-cable. This cable extends 3m and terminates in a 3.5mm plug. A screw-on 6.3mm adapter is provided. It also comes with a clamshell case. There are no extra accessories or portability features. The Amiron Home have been widely accepted to be highly comfortable for extended music sessions. These are great for movie-watching as well. The cable has negligible cable noise, so you won’t notice if it moves. They allow your audio to leak out because of the open-back design, another reason not to wear them in public spaces. The Beyerdynamic Amiron Home are considered pricey headphones by most people. But even by those standards, they are big bang for the buck. If the design is brilliant the audio response is brilliant still. There’s a sheer musicality to these headphones that usual audiophile gear trades for accuracy and a clinically clean presentation. It has slightly forward upper bass and mids which lends just enough warmth to the music to make it enjoyable. The soundstage is open but not diffused. It is balanced with an intimacy which presents the audio in front of your face rather than away from you. The instrument separation and spacing is spot on. Coming to the individual elements of the audio of these audiophile headphones, the bass is impactful and defined. There is not the slightest bump in bass or the benefit of a closed-back here. But Amiron delivers hard-hitting bass for the audiophiles. The midrange is deeply insightful into the details of the vocals and strings. They are pleasantly revealing and aided by the strong bass. Both male and female vocals are treated with equal reverence. The treble is highly detailed and smooth. There’s not a touch of harshness in the highs unless a very sibilant source is played. The volume range of the Amiron may be limited by its 250Ohm Impedance. We recommend using a suitable headphone amp with them. into a headphone-sized package. They go all out on their technology drawing from intricate technology of their homeland. The audio is tuned to sweep the audiophiles off their feet. They offer incredible comfort, all the modern conveniences like detachable cables and a bold design. Wild horses couldn’t have kept them out of the best audiophile headphones list. The Sony MDRZ1R Signature headphones reflect Sony’s abstinence from loud style touches. They are done in all black but there’s every indication that they are premium. They own the black like it’s meant to be. They arrive in a large premium box, nestled in soft silk cloth. The earcups are large and circular. The headband is relatively slim and amply padded. The earcups are mounted with plush and deep earpads sheathed in genuine sheepskin. So is the headband and stitched along the edges in black thread. The earcups can swing forward to hug your head. The finer design details are under the hood: a special acoustic paper filter made of Canadian softwood fibers using a specific Japanese paper technique, a stainless steel Fibonacci-patterned grilles and a magnesium dome for the earcups. All frills aside, these are extremely comfortable for use. These audiophile headphones pack whopping 70mm drivers. The ear pieces are beefy as a result. The headband has a titanium core. There’s use of metals on the earcups as well. But the overall weight comes to 385g which is not bad for an at-home open-back headphone. The MDRZ1R has detachable cables. It comes with two: a straight cable ending in a 3.5mm jack and another with a balanced 4.4mm jack for the gear. Both cables are 3m long which gives you plenty of room to move around. It comes with a pouch for holding the cables. The balanced cable is the better option to get the best sound out of the Sony MDRZ1R Signature audiophile headphones. Their frequency range stretches all the way from 4kHz to 120kHz. This lends a palpable power to bass which is unheard on purist gear. The low end has a visceral impact in spite of being balanced and unboosted. The sub bass extension sets the ears throbbing and puts bass in the right perspective. They can produce the lower registers most genres demand. It is tight and agile in its performance. The midrange shows what these audiophile headphones are capable of. They are articulate and flow through the details effortlessly. We threw some complicated mixes at them and heard every last detail. The bass enables the vocals to sound full and rich. The treble is crisp and highly defined. The textures of music are presented in an immense soundstage. It lends an airiness to the instruments and their placement is spacious. The sound signature of the MDRZ1R is unmistakably dark which we preferred for both music and movies. Big fans of classical music may want them to be brighter though. The large ear pieces provide more noise isolation and lower audio leakage than expected of open-back headphones. time of their announcement. Their audio has been a hit and a miss with the wider audience. But Monoprice has definitely achieved a feat here by delivering on most promises made by this types of headphones. The design has evolved with continuous user feedback. 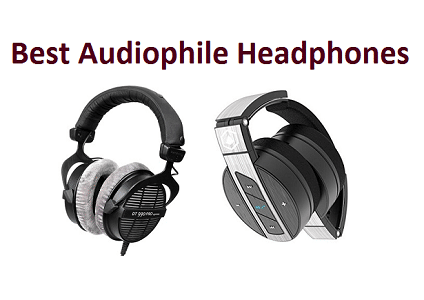 They are finally in a place where they can stand in this best audiophile headphones list. The Monoprice M1060 audiophile headphones have an open-back design. Instead of the usual grille on the earpieces, they have gone for a geometrical design. 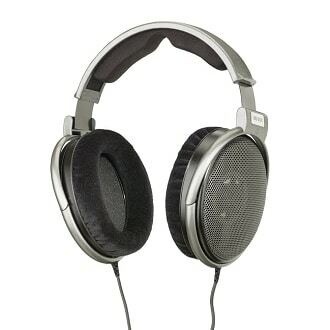 Overall the headphones are big and dorky-looking but that’s a chance you have to take with planar magnetic cans. The round earcups have large plush angled cushions. These have a deep niche inside for your ears to sit. The earcups are finished with a wooden ring between the earpads and the backplate. The headband has a suspension design. A metal band holds the earcups together. But the headband is a piece of leather that adjust automatically to the size of your head. This leather ban is also padded for comfort. The M1060 is heavy and it starts to show after 3-4 hours only. The soft cushions and the average clamp helps offset the weight. The earcups of these audiophile headphones swing forward in their forks to cover your ears snugly. The headband can be extended. The M1060 has a detachable cable. A 2.5mm jack with attach to either earcups and the cord terminates in a 3.5mm jack. The cable is fabric-braided and thick. The jacks are housed in metal. The impedance is rated at only 50Ohms so they can be driven directly by smartphones. But for the best experience, we suggest using an amp. A carry case and a 6.3mm adapter are provided with the pack. The earcups fold flat for storage. The Monoprice M1060 audiophile headphones show all the sonic hallmarks of planar magnetic design. These are brilliantly detailed, a wide soundstage and a somewhat unfinished midrange. First off, the bass is very well-extended into the sub bass region. They have exceptional punch and definition. The quantity and quality of bass makes them sound much more exciting than your average audiophile cans. They have taken special care to keep upper bass tight and agile. The midrange is detailed and neutral, maybe a little bit too neutral which make the vocals and strings sound less musical than the lower frequencies. They are also supported by a wide soundstage which is not quite deep. The mids are definitely revealing here but they just don’t sound as warm and emotional as the Sennheiser HD650. The treble is smooth and relaxing. These are pretty articulate and can handle complicated music effortlessly. The instrument separation is enough and you get a very airy presentation throughout. An amp and a DAC would considerably improve your audio experience. These aren’t worse or better than a particular headphone at their price tag but they are just different. The Grado Professional Series PS500e audiophile headphones are like Kale Fries, Healthy and a guilty pleasure. These headphones play studio-grade music but are a downright hoot at the same time. These are on-ears that can be converted to over-ears easily. The smooth audio makes you want to revisit your old favorite tracks and discover new things about them. These take a well-deserved place in the best audiophile headphones list. The Grado PS500e headphones are on-ear cans. These have round earcups with massive cushions. These deep pads are round and sit on the ears. They are draped on soft velour. The earpads can be swapped for the bigger PS1000e earpads which sit around ear. The ear pieces have mahogany core and finished with aluminum backplates. They can be swiveled to find the right fit over the ears. The ear pieces are connected by a wide but slim headband. They have leather finish on top and velour sheathing underneath. The PS500e weigh around 12 ounces and are average in this department. But they stay comfortable for continuous use. The cables are attached to both earcups of these audiophile headphones. This is an extremely think cable ending in a 3.5mm jack. A 6.3mm adapter is provided. The thickness and shortness of the cable might be annoying for some since this might weigh the ear pieces down. As usual Grados is sparse in terms of other accessories. These are straight up audio headphones only. The Grado PS500e headphones create a very immersive audio experience where the audio is something you feel rather than just listen to. They aren’t clinically flat or so revealing that all but the best formats sound good. These are headphones meant to enjoy the music. They are slightly dark with sparkly treble and plenty of character. They are very detailed and smooth so any imperfection from the recording is visible but not presented jarringly, so they can be ignored if you are listening for leisure. The signature of these audiophile headphones has slightly forward mids. The vocals shine through in a spacious but intimate soundstage. The mids are also very detailed and graceful in their presentation. The bass is extremely punchy. It’s hard to believe these are neutral headphones because they play EDM and Techno with some panache. They have an impact that’s rare of open-back dynamically driven headphones. They sound textured and full at any volume. The treble has plenty of sparkle without any bite. The PS500e make for a very relaxing listen too. experience. We have covered plenty of headphones with flat-as-our-abs frequency response. But there are more than one kind of audiophiles. 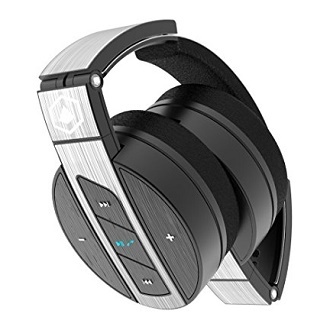 These are ultra-comfortable, closed back design gives you enough noise isolation and allows less audio leakage than the usual open-back headphones. They make it straight to the best audiophile headphones list. 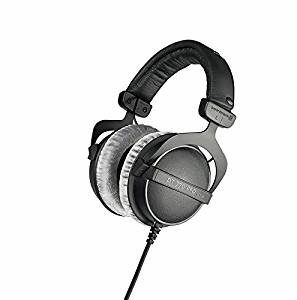 The Beyerdynamic 770 Pro audiophile headphones would make excellent headphones for DJs. They have closed-back round earcups. These are mounted with large and deep earpads. These may sit around medium-sized ears but may sit at the edge of large ears. The earpads are sheathed in grey velour. These are both soft and breathable. So in spite of being closed-back headphones, they can be worn for long hours. They can be removed for cleaning. The forks are metal. The headband is wide and amply padded for continuous use. The one failing of these headphones as a portable pair is that their cable is permanently attached. The cable is 3m long and has to be strung up by a clip. It terminates in a 3.5mm jack. These aren’t foldable so they might be difficult to carry around. 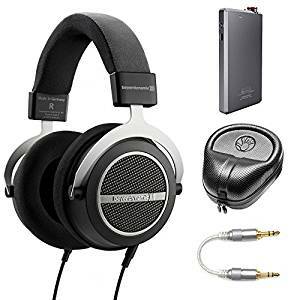 The Beyerdynamic 770 Pro audiophile headphones are available in 3 impedance ratings: 32 Ohms, 80 Ohms and 250 Ohms. We are reviewing the 80Ohm version. This strikes a nice balance between audio detailing and compatibility with the less powerful sources. The 250 Ohm versions have slightly better resolving capabilities and if those differences are apparent to you, they would make a better choice. There’s also the Premium version of 770 headphones. These have slightly tighter bass compared to the Pro which are more geared towards DJs. These audiophile headphones have a strong and present bass. It isn’t as tight as the Premium cans but its sure brings a darkness and richness to the audio that we are all guilty of liking. The mids are muddied but the bass takes away some of the attention from them. There’s a bit of bite in the treble that matches it up with the treble. This is a signature Beyerdynamic move that brings more energy into the audio. These are pretty revealing for the price. The soundstage is open for a closed-back headphone. Oppo PM-3 audiophile headphones try to check a lot of boxes together. And they fare pretty well. These are one of the most inexpensive Planar Magnetic headphones so they have the control and attack we covet in such headphones. They also restrict the audio leakage with a closed-back design and enhance portability. The merits of these headphones are many and Oppo deserves the kudos for pulling off such a daring feat. They dance into our best audiophile headphones list with style. There’s a lot of metal in the architecture of the Oppo PM-3 audiophile headphones. The headband and the fork that holds the earpieces are all metal. This makes it hit 320g on the scales. But the weight is handled by a heavily padded headband and the earcups. The earcups can fold flat. They feel comfortable overall if you put them on correctly. They provide good passive noise cancellation and do not leak as much as the open-back headphones on this list. These hi-fidelity headphones come with a 10 foot cable that can be detached for carrying around. It ends in a 3.5mm jack and a threaded 6.3mm adapter is supplied with it. If bought from specific sources, you will even get a 1.2m cable with inline remote. You can choose between an Android-friendly remote or an iOS-friendly remote. A fancy carry case is shipped with them. Equipment: Although these can be directly driven by your phone, adding an amp opens up their audio. We preferred the Oppo HA-2 amplifier to do the job. The audio of Oppo PM-3 audiophile headphones walks a fine balance between analytical sound and outrightly fun sound. The tonal balance is spot-on. The sound has the musicality to it without sacrificing neutral performance. They are magical in that they can make any kind of recording sound great. The soundstage is limited by the closed-back design. But the amplification with HA-2 opens the sound up and also improves the detail resolution. The midrange stands out from the sound signature of these hi-fidelity headphones. They put life into the performance of the artists. The vocals are highly detailed and carry some weight in the lower mids. This makes them partner well with the bass. The bass has an average attack that is easy to perceive for most audiophiles. The sub bass detailing is revealed when a complicated bassy song comes along. There’s a slight mid-bass bump that adds volume to the sound. But it is limited to the lower registers. There’s a clear boundary beyond which the bass does not step. So the midrange ends up being squeaky clean. The high frequencies are executed with equal grace. They are detailed but not very bright. Their smoothness makes them easy on ears. They roll-off early to avoid hitting any sharpness or bite in the sound. The good thing it does not fatigue your ears over prolonged listening. But then again the audio sounds more closed-in. Beyerdynamic DT990 Pro headphones pop up in every audiophile discussion. 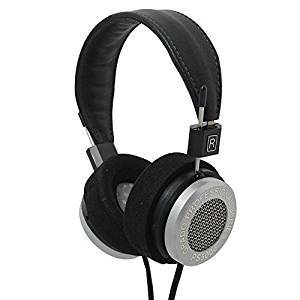 Given the sheer number of music daddies who keep referring to them all the time, these deserve a place in the best audiophile headphones list. There are many versions of the DT990 with different impedance rating and they can get a little confusing. We found that the 250Ohm version is primed for the right kind of amps but does not require costly amp/DAC setup. 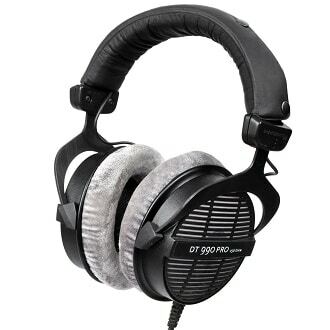 As with most audiophile headphones, the Beyerdynamic DT990-Pro-250 are open-back cans.They are made of high-grade plastic. The forks upon which the ear pieces swivel forward are aluminum. At 13.4 ounces with the wire, they are on the heavier side. But this is offset by the soft round velour earpads on the ear pieces. The headband is also covered ear-to-ear in foam padding. So you feel quite comfortable wearing them for long audio sessions. A major issue with the design of these hi-fidelity headphones is that their cable is permanently attached. But it connects only to one side, so that’s some relief. The coiled cable runs 10 foot long and ends in a 3.5mm jack. A screw-on 6.3mm adapter is also shipped with it. Equipment: We preferred the FiiO E7 and E11 amplifiers with the DT990-Pro-250. Since the headphones themselves are relatively affordable, audiophile-wise, we invested in the well-known amps in moderate price range. An Audio Ocean tube amp can also do wonders to high-impedance nature of these headphones. The Beyerdynamic DT990-Pro-250 audiophile headphones do the detail dance effortlessly. The mids, the highs, the bass all have that mean mix of instruments and intricacies laid out once the DT990 get working on them. They are not entirely neutral with the bassy low end. But the little boost in the lows doesn’t rob them of clarity or balance. These are for the audiophiles who would be bored to death with the analytical nature of AKG K702s. The audio of DT990 is nestled in a wide open and airy soundstage. There’s enough space for the hi-fi headphones to place each and every instrument around your head. The transparency of the presentation makes it easy to fish out the details of the music. The DT990s have an over-achieving bass. It is definitely boosted. The bass extends deep and you get the fullness from the sub bass region here as well. The V-shaped response annoys the purists but it makes the audio more fun. Since the bass is already spiked, they don’t respond so well to the bass boosting from equalizer. The midrange is the true beauty here. The detailing and the soundstage favor the airiness of the headphones. The vocals sound smooth and natural. The guitars glitter with prodigious taste on DT990. Based on the energy of bass, the midrange seems recessed. But all the poise of vocals and guitars are plain for you to see. Given the V-shaped audio response, the treble is also boosted like the bass. Many people like the vigorous combination because music is so much more exciting with these. But they do not confirm to the stringent standards of audio purists. The treble detailing and clarity cannot be faulted. But the sparkle might be a bit too much for those coveting a neutral response. 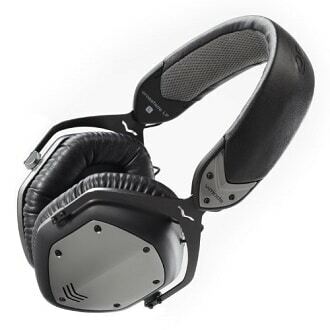 V-Moda Crossfade LP audiophile headphones drew a lot of flak initially for their ‘overtly bassy’ sound. But lately the musicheads have been realizing its true worth. After a substantial break-in period( and we mean hundreds of hours), these headphones play like they are worth their value in gold. If you get them on sale, that’s even better. You can take your chances with them and discover the audio talent under their super stylish exterior. The substance behind their swag makes them perfect for the best audiophile headphones list. V-Moda’s motto is to blend high fashion with high quality audio. And it definitely delivers on both. Just the feeling of the LP audiophile headphones in your hands will tell you that they are built to last. V-Moda has run them through military-grade tests of dropping, headband bending, flexing etc. So that should give you a fair idea of their durability. The underside of headband has breathable fabric lining over foam. The hexagonal earcups are padded lavishly and sheathed in leatherette. The macho-industrial design can attract cult following. These hi-fidelity headphones come with detachable cables. One is a 3-button mic cable and another is a regular audio cable. Both are Kevlar-reinforced. A hardy exoskeleton case, with an elastic band to hold the LPs down, is shipped with it. A 6.3mm adapter and carabiner clip complete the package. 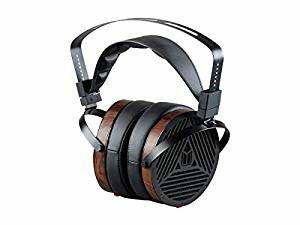 Equipment: Any decent amp like a FiiO E6 or Schiit should be good for these headphones. Their amped performance is different from unamped one but they play consistently with different amps. To get a right estimate of the V-Moda LP audiophile headphone’s capabilities, burn them in for at least 500-600 hours. Ideally you shouldn’t have to go into so much trouble. But it’s worth the wait. They might initially come across as bassy headphones. But the audio soften over time. In fact they offer meatier bass that the previous headphones. Since some audiophiles are allowed to be bassheads as well, LP headphones will suit their requirements just fine. Once the burn-in is over, the bass has good definition. They sound detailed but with power. So if you are into Hip hop, EDM, Techno etc., these hi-fidelity headphones will give you a wow moment. They underline the classicals well by lending them a full-bodied nature. The midrange sounds muddy and recessed initially. But the kinks iron out with burn-in. The details get clearer until you get refinement that surpasses the price of these headphones. The treble can be the only portion that needs a boost on the equalizer. You can find plenty of intricacies in the high frequencies after the burn-in period. But it needs that light pumping to match with the level of bass. Make sure you use a good amp and do not start judging the music plugged right out of your iPhone the first day. Not all of us have the money to spend on expensive audiophile headphones, especially if we are still learning the ropes of audio world. 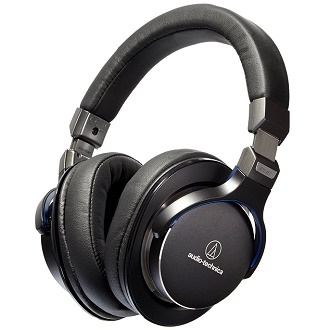 The Audio-Technica M30 audiophile headphones make a nice budget option. In fact, they can blow you away for the price. This is only because A-T maintains the integrity of its audio standards throughout the price range. The clarity of audio and detailing are quite mature for the price. We could hardly keep them out of our best audiophile headphones list. Since the Audio-Technica M30 audiophile headphones are designed for the studio, they are bound to be comfortable. They have cut the weight down to 201g which is in the lightweight corridor for headphones. They sport racetrack oval earpads that sit around the ear than over them. The headband is thoroughly padded between the two earpieces. The construction is not as durable as the pricier M50 but it’s still pretty reliable. The earpads provide a fair bit of passive noise cancellation. The M30 studio headphones have a one-side exit cable. This gives you plenty of scope for moving your head. The cable ends in a 3.5mm plug with strain relief. It is thick and 11 feet long. They are pretty difficult to manage unless you use them only at home or studio.A screw-on threaded 6.3mm adapter is shipped with the pack. The headphones do not fold so they do not score well in the portability department. Equipment: M30 headphones generally don’t require an amp. But an inexpensive amp like the FiiO E5 will help. It will tone the bass response for a smooth sound. The Audio-Technica M30 headphones can serve any budding audiophile’s demands. And we weren’t expecting that at its price. These are closed-back cans but the audio does not sound closed inside your head. Rather the effect is more 3D like the open-back headphones. They have a warm, laidback sound set in a sizeable soundstage. You will never feel the audio fatiguing you even after long hours of listening. Owing to the flat frequency response, the bass is toned down compared to the M50x. It might not be enough for the bassheads. But folks educating themselves about neutral audio will be satisfied. The bass is just enough to make the rest of the frequencies sound natural. The agility of bass is lower than the famed M50x. So the audio is more relaxed. The extension of bass is only moderate. The mids are a tad recessed in comparison. But they are quite refined for the price, just not hi-end refined like ATH-MSR7. They sound clear and articulate and aren’t muddied by the bass in any manner. The treble is very crisp on these audiophile headphones. They are the most neutral sounding part of the spectrum. The treble detail is matched with equal clarity. With an amp we would definitely use these at the home studio before moving up to the pricier stuff. Grado SR80e hi-fidelity headphones are the talk of the audiophile town. They frequently get pulled up for a comparison and end up on the winning side. The fact that these cans lie in the sub $100 category helps their street cred. These are open-back on-ear design that provides plenty of bass for the audiophile palate. The hi-resolution audio comes alive in your ears. Grado SR80e are the best audiophile headphones in their price range. The Grado SR80e audiophile headphones have a supra-aural design. They are very comfortable to wear, no doubt. But make sure you are ready to ditch the over-ear pads for these. They have round ear pieces fluffed with soft foam that makes contact with the ears. We didn’t have any issues wearing them over long hours, but it depends on the user. The headband is a strip of leather. Since the SR80s are lightweight, they exert minimal pressure on the head and ears. The earcups fold flat for easy storage. These hi-fidelity headphones are connected to a Y cable that extends long enough to connect to the audio equipment. A 6.3mm adapter is shipped with them. There aren’t any more accessories with them. Most of the investment goes into crafting thestellar audio and hand-assembled architecture. Equipment: Although these can be driven directly by a portable source like the iPhone, the SR80e would do well with the control offered by a FiiO E09K. An SMSL SAP II will work just fine if you have a smaller budget. 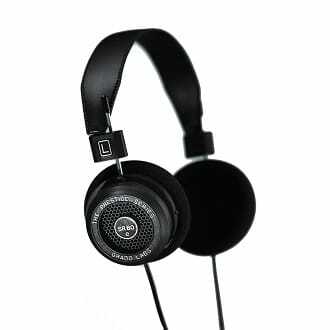 Grado chucks the frills for sound and that’s evident from the SR80e audiophile headphone’s performance. These are detail-oriented, warm headphones that are easy to listen to. If you are just developing audiophilia, these can help you transition towards hi-resolution audio. Even at the low volumes, you can distinctly hear the artists sighing and the general environment of the audio recording. Unlike the other favorites in the sub $100 category, the SR80 aren’t overly analytical. They are smoother-sounding and made for the audiophiles who like to enjoy the audio rather than pick it apart looking for neutral response. The soundstage of Grados is comparatively open and wide because of their open-back design. The accurate stereo-image has a spacious stage for its presentation. The midrange is where all these characteristics shine. The intricacies of good quality audios are all there. Grados are known for their decadent mids and SR80e deliver to that promise. The warm mids compliment rock and jazz very well. The bass is punchy and, meaty. But it doesn’t stand out compared to the mids. It will easily suffice for an audiophile with purist tendencies. But the bassheads should look elsewhere. The treble is just as detailed. But it can be a tad harsh in some songs. The amp irons out the discrepancies. It’s the only flaw the otherwise natural audio of SR80e hi-fidelity headphones has. HiFi Elite Super66 audiophile headphones are a surprise pick. We call them audiophile headphones because they have the potential to be one. They just need to be discovered. Because of their rather affordable price at the time and new brand name, they haven’t been taken seriously. Once you get them in your hands, they erase all apprehension. They are quality headphones, both physically and sonically. They bring Bluetooth into the picture and steal the show at the best audiophile headphones list. If you are expecting rickety plastic headphone, the HiFi Elite Super66 audiophile headphones will shock you. The headband is all metal, gracefully brushed for its classy look. The earcups are large round, tending to oval shape. One earcup has the logo branded in black. The other side has buttons. The whole gadget-like appearance is like something out of StarTrek. But unlike HD800, the Super66 are all subtle about it. Another useful feature is that the arms can fold up to make the headphones more portable. These hi-fi headphones have two large volume buttons on one earcup. A middle strip that runs through it carries the Play/Pause and track navigation buttons. While we were happy that there are separate track forward/backward buttons, we wondered why the Play/Pause button wasn’t more prominent and easier to find with fingers. The Bluetooth connects seamlessly. You can also operate these audiophile headphones in the wired mode using an accompanying wire. Equipment: The HiFi Supper66 wireless headphones are easy to drive directly from the portable sources. These are best for novice audiophiles who want to dip their toes in quality audio before moving on to Senns and Ultrasones. We kept hearing rumors about these wireless headphones which were at par, if not better, than the expensive Beats wireless. And sure enough the HiFi Elite have the chops to match that claim. We were bought by the detailing of audio across all frequencies. The sound remains clear almost up to the top volumes. The bass is created to sell here. There’s a definite bump in mid bass but it has been skillfully done. The lower-registers do not bleed into the mids. The bass also extends well into the sub bass regions. So you hear their weighty presence even at low volumes. We think the bass is perfect for a transition from basshead to audio purist. It will be easier to differentiate good bass from boomy bass with practice from such hi-fi headphones. The vocals are buttery smooth and nuanced as portrayed by Adele’s tracks. They sounded lively and well-staged inside the open soundstage of these audiophile headphones. The midrange sounds rich and full-bodied. The hitherto unknown details jump out at you from the corners of its audio realm. The highs are smooth and crisp. They don’t have any extra brightness. For experienced audiophiles, the sound signature of the HIFi Super66 may have many problems. But you have to remember that these are relatively inexpensive headphones. They do their best to be hi-res without being analytical.